Size: Various Sizes dependent on hole cut out size. See table below. Acoustic Hoods are designed to reduce noise leakage through inset ceiling lights by compensating for the hole cut into a normal ceiling for the fitting of the light. The Acoustic Hoods are lightweight and produced from a sound absorbing, fireproof material that is vented to allow heat to escape and supplied with a wire frame to help fix and give it support. 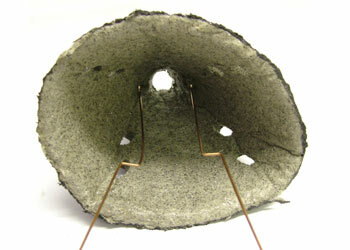 They can easily be folded to fit through the hole in the ceiling where it is to be sited. They are designed to reduce noise penetrating through to rooms above where inset ceiling lights are fitted and perform to within 1dB of the equivalent, single plasterboarded ceiling with no holes. They can also be used in ceilings that are fire rated and due to their intumescent ability will give a full one hour fire resistance giving peace of mind to people in rooms above and for complying with the appropriate Building Regulations when necessary. 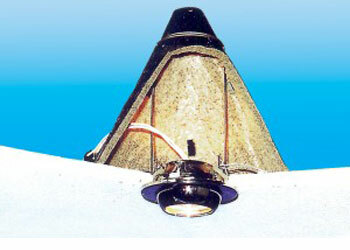 Down lighters in ceilings are widely used in commercial and domestic buildings. Each ceiling is subject to fire regulations and where applicable the ceiling construction needs to be fire rated. When a fire is evident, due to its intumescence, the cover will expand sealing the hole and will also char, rendering the cover incombustible and maintaining the integrity of the fire resistant ceiling. IF BUILDING A SOUNDPROOFED CEILING WE WOULD ALWAYS ADVISE AGAINST THE FITTING OF INSET CEILING LIGHTS BECAUSE EVEN WITH THE INSTALLATION OF ACOUSTIC HOODS OVER THEM, THE ACOUSTIC PERFORMANCE OF THE CEILING WILL BE COMPROMISED. THE HOODS ARE ONLY DESIGNED TO BE FITTED INTO CEILINGS WITH A SINGLE LAYER OF PLASTERBOARD OR FIRE LINING BOARD.